I had a particularly lovely, nourishing & sacred breakfast experience this morning because my new handcrafted textiles were hard at work bringing the spirit & beauty of my old life together with the living of the new. This email came from Lissa the day after she received the custom table linens she’d ordered from me. Twenty months after her husband died, Lissa realized it was time to sell the cottage they’d shared and move to the city. A lot of the things she and her husband owned were handcrafted and she wanted to build on that in her new urban home. Lissa looked and looked for table linens. Friends and family, who wanted to give her a housewarming gift, looked and looked. Nothing hit the mark. Wait a second, she thought. If this is hard to find, then it probably doesn’t exist, not exactly the way I want it and not with the spirit I want. 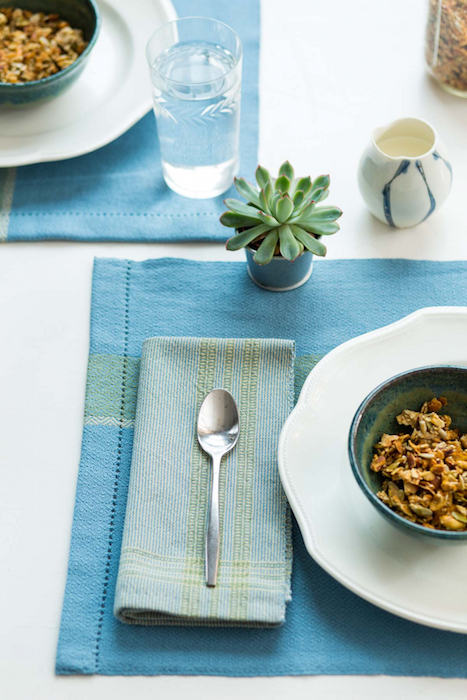 As she let herself think about what these table linens could be, she grew excited about having something not just artisanal, but handcrafted in partnership with her, with the colors from the last chapter of her life. Lissa had previously bought two Whimsy & Tea towels that were a semi-custom order so she knew she liked my work. She abandoned the search for anything commercially available and got in touch with me. We arranged a phone date to discuss colors and designs. We looked at pieces on my website, asked each other lots of questions, and the details of her project started to crystallize. 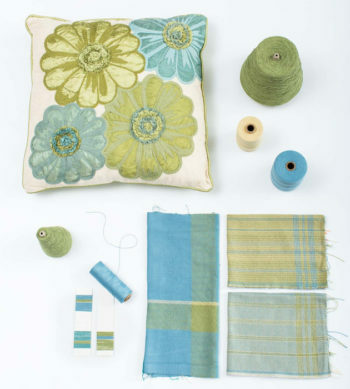 She wanted napkins, placemats, a table runner and kitchen towels. All the pieces would have the same colors and there would be two different designs. Plus one of the designs would be in two different colorways – one predominantly blue and ivory with green accents, the other predominantly green and ivory with blue accents. Lissa sent me the pillow that was her color inspiration for this project. This way I could hold my threads against the fabric and match the colors as closely as possible. One morning I heard the UPS truck stop at the end of my driveway. I greeted the driver at the door and immediately opened the parcel, took out her pillow and started playing with colors. Guess what arrived, I wrote in the subject line of an email and attached a photo with some initial color ideas. 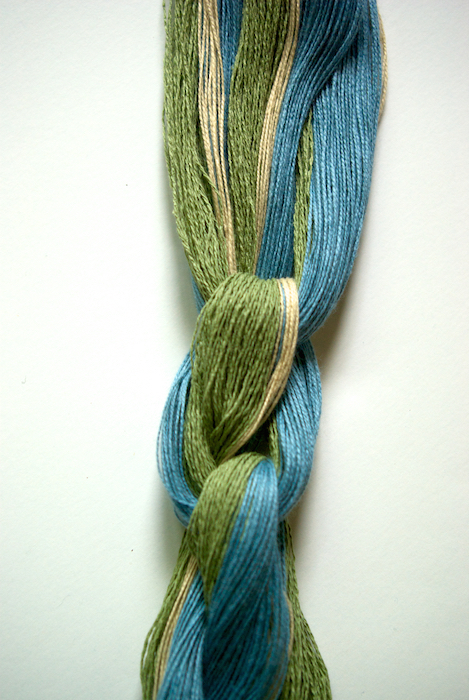 I was able to match the blues, but the greens that I had weren’t right, so I ordered color cards from other cotton companies. One had a good green, but their blues were off. A few emails and a phone call later, we decided to use two different companies and settled on three colors: a light yellow-green, a gray-blue and ivory. I calculated how much cotton I’d need for each project and placed my orders. The blue we wanted was on backorder for two weeks. A fortnight later, I received the disappointing news that it would be another three to four weeks before the blue arrived. No worries about the delay, Lissa wrote. I’m not the least bit disappointed (I have mentioned I love anticipation, yes?). To be honest, the delay just makes the day when all your glorious handiwork arrives here in its new home that much sweeter. Fortunately, I had enough blue in stock for the first group of towels and napkins, so I set to work and took some photos along the way to share with her. LOVE LOVE LOVE the pictures, Lissa replied. Thank you so much. I find myself wishing once again you were close enough to visit. 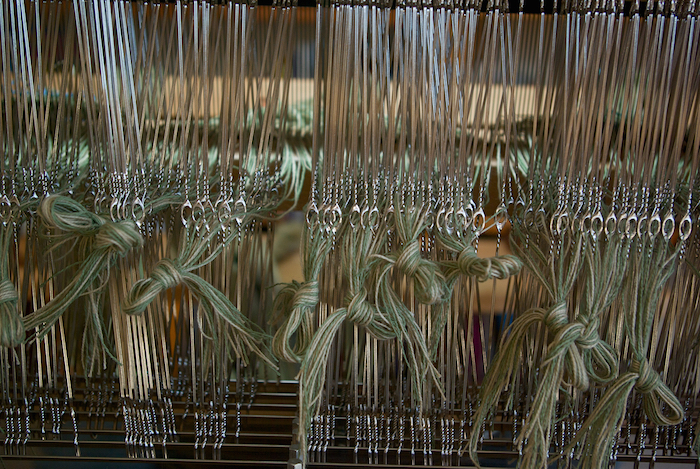 The photos deepen my appreciation for both the painstaking set-up that goes into preparing the loom and the ‘inner workings’ of the process. All those threads! And then to see the image of what’s created when everything’s woven together – very satisfying. I can only imagine how it feels for you. When the blue finally arrived, I eagerly got to work on the second group of napkins and towels. And then moved on to the last project, the placemats and runner. Once everything was hemmed, tagged and ironed, I carefully wrapped up all the napkins, placemats and towels and sent them on their way. Two days later Lissa wrote, Guess what the UPS man just brought to my door? Squeee!!! Everything’s beautiful – and each piece is already in its rightful place. She’d promised her daughters that they would have a meal using the table linens right after they arrived. Over dinner she enjoyed watching the textiles become personal to them. She laughed while she told me, It was quite funny. They ended up fighting over them because Holly prefers the color blue and Megan prefers the color green – always have. Megan said, “So the green ones are mine, right?” It was a delight to watch them incorporate them into our family story. I wish I’d known about you before my girls got married, Lissa told me later, because I would’ve had table linens made for them as a wedding gift. After using her table linens for a few weeks, Lissa has discovered that she particularly enjoys a handwoven napkin. Having something so beautiful in my lap or in my hands while I’m eating makes the meal special. I’ve actually pulled two out that are mine. Others are for family events, but these two belong to me and go in a special drawer. Eating alone can be a lonely business, especially when you’re grieving. I still have my days, but when I have my napkin in my lap or I look at the placemat in front of me, the spirit of my life is with me. The spirit of my life with my husband and all the things that were beautiful and nourishing about it, are alive with me right now. P.S. Custom orders hold a special place in my heart. If Lissa’s story inspires you to think about something special for your home, I’d love to talk. 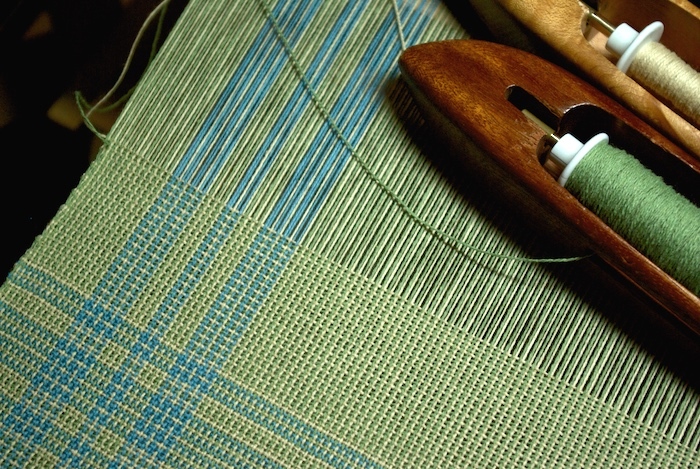 I went to Vavstuga Weaving Studio last month and took her basics course and am excited about weaving using some of her ideas. Unfortunately, I have a Jack loom and a lot of her great warping techniques for Glimakra type looms won’t work. I bought a bagful of lovely Cottolin spools and have been fondling them.